OK. To be perfectly clear, I am not a seamstress, or anything that resembles a person who can sew. In fact, I think my skills are somewhat laughable, at least from my husband’s standpoint. He is great with a needle and thread, but his mother is an amazing seamstress, so I claim “unfair advantage!” Nobody listens to me though… They both just laugh at me. Point being: If I can make this nursing tank, so can you! It’s so easy, it will take you approximately 10 minutes, and save you 25 dollars! 25 dollars is how much it costs to buy a nursing tank from here. With the slick design and supreme functionality of the tank top, it’s nearly irresistible. It turns any shirt into a nursing shirt, hides your lovely lady lumps, and helps to give coverage, ahem, privacy for a nursing mama in public. In fact, I was wearing my tank top under a (regular, button-less) shirt at a meeting tonight for our local bee keepers association, and I felt totally comfortable nursing Sweet Baby in a large crowd. But that’s just me, and nursing debates aside, this is a great invention, (I wish I’d have invented it), and every nursing mama needs one. It is easy to see how one would willingly fork over 25 dollars, and quickly, to get one of these bad boys! Furthermore, when you are sleep deprived, frazzled, and busy, it seems like the completely logical thing to do. I almost did it. In fact, I was in the checkout of that website, and had a freaking “ah-ha” moment! Crystal, clear. A holy-cow, that would be so-easy-to-make-moment! Don’t you just love those? 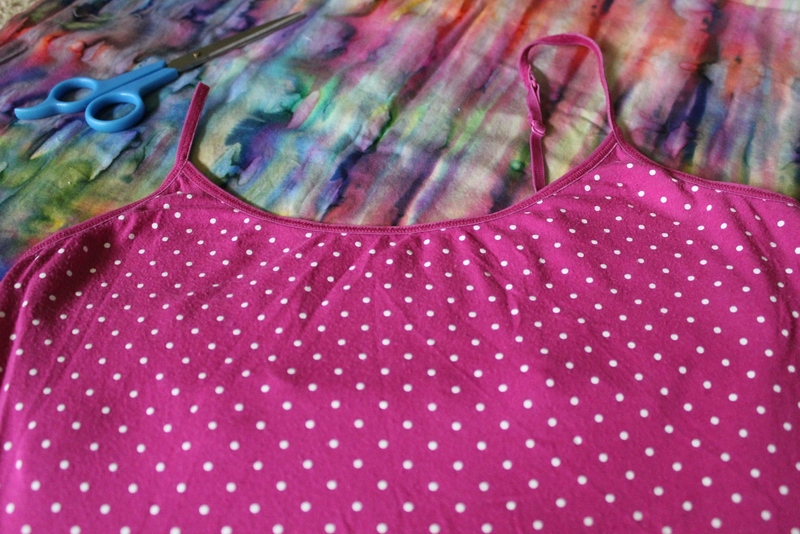 Well, maybe not like I do, but I assure you, if you can thread a needle, and have an old spaghetti strap cami laying about, you are going to love this DIY! 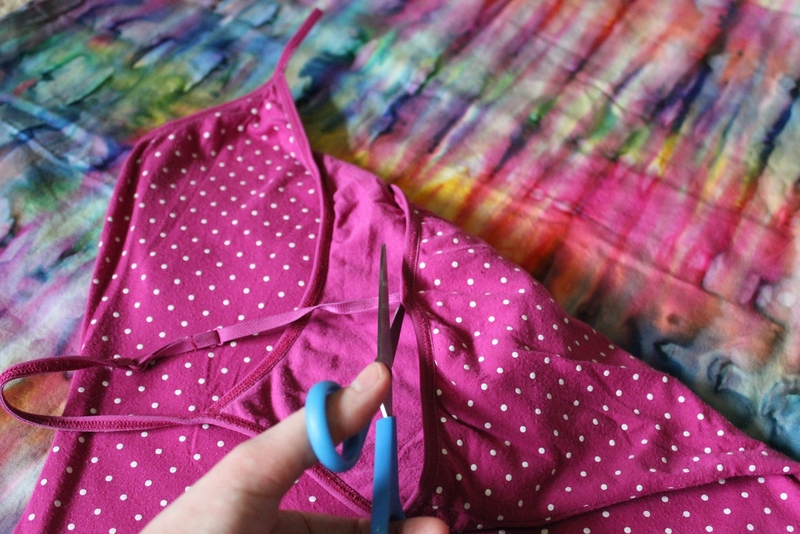 First, using a seam ripper, or scissors, (if you’re lame like me), take apart the strap from the back of the tank top. Next, cut the strap of the tank down to 1.5 – 2 inches long. Don’t cut it too short or it won’t work. You can easily trim the excess. Once completed, slip it on over your nursing bra, and slip the loops down over you bra hooks, as shown above. Isn’t that super-fantastic? I pick those camisoles up for 10 dollars at the maximum, usually 5. 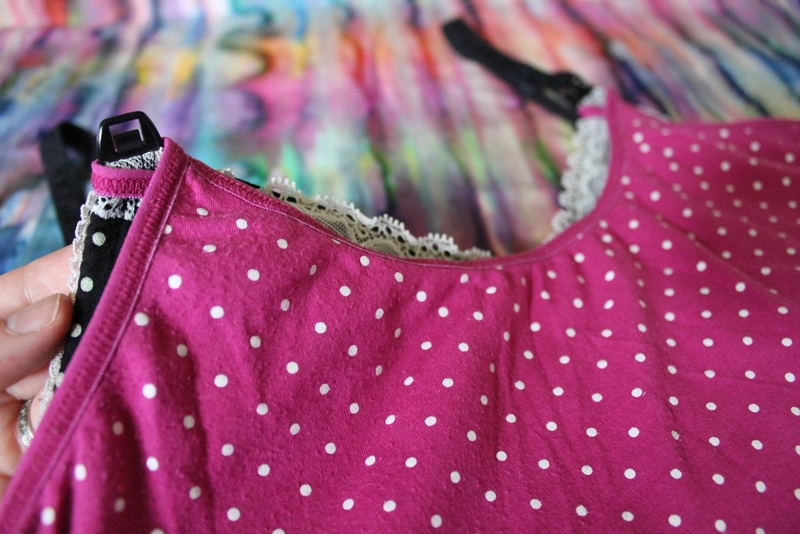 I used my maternity tanks for these at first, and then converted some of my other old ones. They are super handy, and maximize the amount of shirts I have available to wear, because now everything doesn’t have to be a button down. I just pull my outer shirt up, flip the bra/tank down, and nurse on. Nurse on, Mama. Nurse on. This is really great. My nursing days are quickly coming to an end, but I know TONS of women who this would be helpful for. Great work! Thanks, Colleen 🙂 Share freely. Every mama needs one, don’t ya think?! I will be so sad when my nursing days are over. It’s so special. Awesome! I wish I had seen this 4 years ago when I was nursing my 5th and last child. You nursed 5 babies, you’re my hero!! 🙂 Thanks for the invite, I would love to link up. This is ingenious! I am completely unable to sew as well. Thank you for linking up at Wildcrafting Wednesdays! Thanks, Theresa! Every mama should have one of these 🙂 It has really come in handy! I wish I had thought of this when nursing my two singles and then twins…congrats on figuring it out how to do it yourself! You are gonna make life easier for so many mamas! These looks great and so easy! Wish I had one when I was breastfeeding! Thanks for sharing all your fabulous posts on Natural Living Monday! 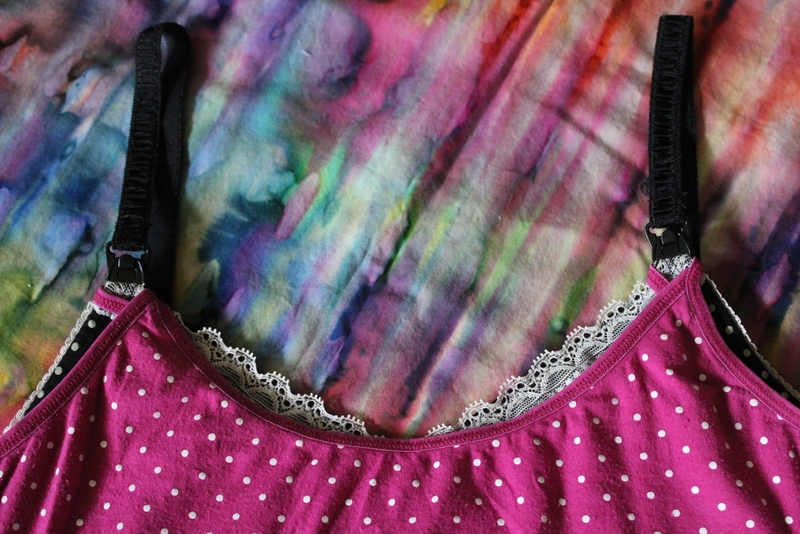 I am due in August and just ordered 10 camis from nomorerack for $30… that makes this project $3 per nursing tank!! AWESOME IDEA! Thanks so much for just saving me well over 100 dollars!! Ok so this is a genius idea, and I have what may be a stupid question… are there any problems with the back staying up since the straps have been removed or am I missing something? Very new to sewing so I’m just wanting to make sure I do this right…. baby #3 due in 3.5 weeks so I wanted to make some of these before little missy gets here! Do you think tube tops would be easy to convert if I add a strap to it? I think this is a great idea !! I am a seemstress and never ever thought of this myself. DUH!! I think that this should not be just for nursing mothers though. I know that many women that are large and attempt to wear the skimpy strapped tops and then are dissapointed with the way it looks would love this as a viable alternative. I would like to offer this to my friends so that they can feel more comfortable wearing stylish casual wear. Please share the info far and wide! Everyone should have access to this easy and amazing tank-conversion. I love your idea for larger women. Absolutely brilliant!